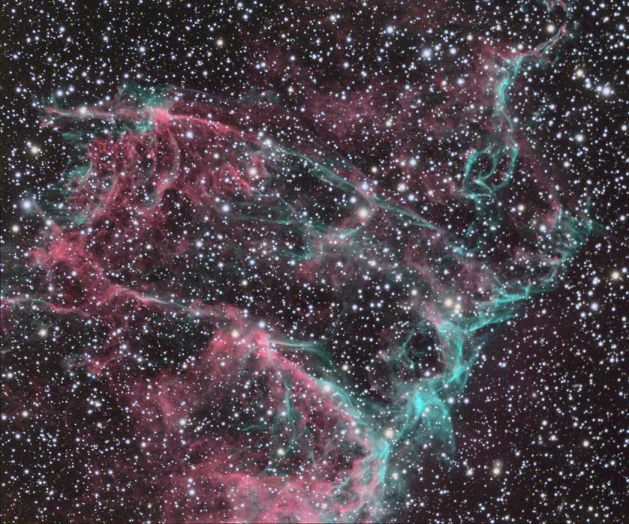 Explanation: These ghostly filaments of interstellar gas are just a small part of the expansive Veil Nebula, seen against a rich field of background stars in the long-necked constellation Cygnus. Also known as the Cygnus Loop, the Veil Nebula is a supernova remnant, the expanding debris cloud created by a stellar explosion whose light first reached planet Earth from 5,000 to 10,000 years ago. About 1,400 light-years away, the entire nebula now appears to span an over 3 degrees on the sky, nearly 6 times the apparent size of the full moon, but is faint and can be difficult to see in small telescopes. The region captured in this beautiful, deep, color image is located at the southern tip of the Veil's eastern crescent. It covers about 10 light-years at the distance of the Veil and is cataloged as IC1340.